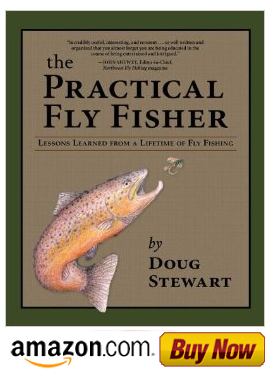 Fly Fishing with Doug Stewart: A Fluttering Stone or an Impostor? The Deschutes River has a variety of water types that harbor the famous Redside trout. It is also enriched with a diversified riparian zone which consists mostly of sage, tall grasses, willows, alder trees and pine trees. Many fish live under or close to this protective canopy and it also gives fish access to a variety of food sources that live in their domain, float through it or inadvertently fall into it. These areas also give the fly fisher good cover from which to make effective casts to an unsuspecting trout. It is almost a setup deal! I located a place to fish that had these types of surroundings, and I was armed with my favorite stonefly imitation, the Fluttering Stone. I stripped out some line and waited for a rise. The faster current above had blended into a gentle riffle that was broken-down by numerous large boulders. Suddenly, a nice fish rose about 15 feet out and above my position. I quickly stripped out my line and cast about 6 feet above the riser. The fly passed over its holding water without a take. As I paused and waited for another rise, I felt something crawling on my neck. Thinking that it was just a stonefly, I held my position, hoping for action. Suddenly, the fish rose and as I started to cast, I felt a sudden pain on my neck and quickly swatted off a large spider. This experience didn’t deter me from fishing these locations again, but before I entered I always shook the brush and branches to dislodge or ward off any creepy crawlers. Sometimes you have to have a stubborn attitude and put up with some nagging inconveniences to catch fish. Such is the case in Eastern Oregon where there are many types of noxious weeds and critters that you may have to deal with—a variety of insects, weird bugs, snakes, and even plants like poison oak and tansy ragwort. In order to survive, you have to try to live and fish in harmony with them or find a less intimidating outdoor activity.